Why Give Freely of Your Time and Expertise? 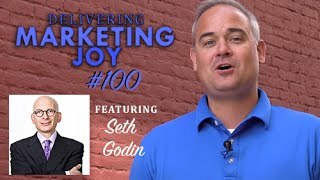 In last week’s Delivering Marketing Joy, Episode 100, Kirby asked Seth Godin why he gives so much of his time teaching others in the industry. Mr. Godin pointed out how different people performing above and beyond their required duties will lead to a better world. He stated, “We all want to live in a society that pays it forward.” But the question to all of us is, how mush do we actually contribute? We might want the world to be a better place, but who wants to take the time out of their busy schedules to make a difference? We all should try to do something to improve people’s lives, and what better place to start than our area of expertise? If people are divided and secretive within their own industry, then how will there be growth in these economies? The growth will be much slower because helpful knowledge is withheld. Because of this, Mr. Godin pointed out that if the individuals within an industry are divided against one another, then people cannot grow. People need to build the industry together, so you can help by sharing your expertise. This allows us all to achieve higher goals! We have all been there, the new guy in the industry; starting from scratch and barely knowing anything. Hopefully, people were there to guide you as you took your first steps! Even just learning an unknown skill can change someone’s profitability. We hope this blog was helpful to you, and we also encourage you to check out the entire video, as well as the great man himself at: http://www.sethgodin.com Want to keep up all the time? Make sure to join our VIP List! Our VIP’s get an email with the latest content…and other special offers as well. Join here. It’s the moment we’ve all been waiting for! Hasseman Marketing celebrates Episode 100! We are all excited about our guest speaker, Mr. Seth Godin. This man is a legend in the marketing world and is very famous for his popular blog. Seth is also a Best Selling Author and has written eighteen books that have been translated into 35 different languages. Please take the time to check out these amazing works. In Epidode 100, Seth Godin reminds Kirby to make a ruckus! Mr. Godin states that if you don’t want to be viewed as a commodity, then focus on what exactly people want. Find out something you provide that only you can provide, and then align that with what the customer wants. He also states that if you’re giving of your time to the community, then you are not taking part in a privilege. According to Seth, you cannot give in a world where everyone just takes stuff. He states that he would rather live in a world where everyone teaches and pays it forward. 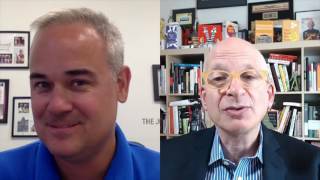 Seth Godin touches on his heroes and explores the differences between heroes and mentors. He encourages everyone to checkout his blog, Heroes and mentors. According to Mr.Godin, we will most likely give and give, but we will never get our share in return. People shouldn’t give for the purpose of expecting their business to improve. He believes that the only way to improve your business is by making it the only one they will choose. Each company needs to find something that customers would say sets them apart, which is where the higher pay margins will come from. Kirby also gets Seth to discuss the altMBA program, in which people are taught to see the world differently; to speak and be heard. 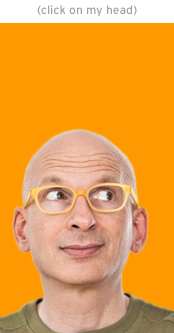 Don’t miss the opportunity to hear Seth Godin’s ideas about content marketing. Use this experience to give advice to people who don’t want to invest the time preparing, and just want to sell something now! Want to keep up all the time? Make sure to join our VIP List! Our VIP’s get an email with the latest content…and other special offers as well. Join here.